Matt Goldman & Rachel Howzell Hall at The Poisoned Pen! 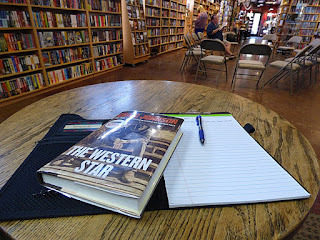 Sunday, September 10, I climbed aboard the Jeep and headed over to The Poisoned Pen to see two new-to-me authors, Matt Goldman and Rachel Howzell Hall. They would be talking about their latest books. 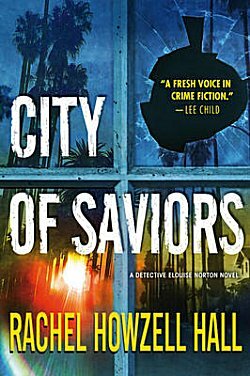 Gone to Dust is Goldman's debut novel, and Hall's City of Saviors is the fourth book in her Lou Norton series-- a series that has been on my radar for a while. My vantage point in the back. Barbara Peters came in early to say hello to the authors and to see how things were progressing. She's standing in the photo above, and the woman to the left with the black and yellow backpack behind her chair is author Rachel Howzell Hall. Once the event began with Poisoned Pen staffer Karen in charge, all the seats were filled. I'm always sad when there's a small turnout, but these events often are the most fun and informative. Karen's introduction of both authors let us know that Hall is on the Board of Directors of the Mystery Writers of America, and she collaborates with James Patterson on BookShots. 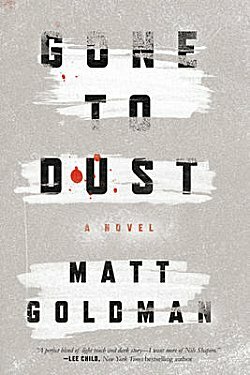 Goldman is an award-winning writer for Seinfeld, and his book Gone to Dust has been adapted for the screen and is on the market to be optioned for film. Having read both books, Karen was impressed by their bizarre crime scenes, their strong sense of place, and their irreverent sense of humor. "Both of you have a sense of humor that I found refreshing," Karen said. "More than once I found myself commenting that I hadn't heard anyone say that out loud for a while. And both of you give a very real sense of the political side of an investigation." "It's funny that you should say that about our senses of humor," Hall said. "We've been told that our humor almost sounded alike. I don't know if it's because we have the same editor or not!" Karen began talking about City of Saviors. "It's the hottest day of the year in Los Angeles, and there's a dead man in a boarded-up house. Your Lou Norton is an African-American woman in a good old boys club. She's also been recently promoted, which will undoubtedly cause problems." Hall nodded in agreement. "City of Saviors is also church-related. It's about people trying to help people. Lou is back in her old neighborhood trying to save people whom she left behind when she left to get an education." Goldman's character Minnesota native Nils Shapiro went through the Academy but when the budget cuts came, he was caught in the "first hired, first fired" cut. Shapiro then decided to become a private investigator. "When local police find that their crime scene is a house with a body that's literally covered in dust, they don't know where to start," Goldman told us. "They haven't investigated a murder in over a decade, so they bring Shapiro in as a consultant. I've been told that this book is 'too Scandinavian' but I've never been to Scandinavia!" Rachel Howzell Hall (L) asking a question. Karen then asked about each author's background. "I was a quiet kid growing up in an at-risk neighborhood," Hall replied. "I was a voracious reader. I was an observer. A lot of what I saw bothered me, but I internalized it, and the only way I could deal with it was through writing. I soon discovered that the 'dark side' interested me, and I wrote a play when I was in the third grade that disturbed many of the grownups! My first book was psychological suspense, and I've learned that the best way for me to solve the things that bother me is through my writing." Matt said, "I was a chemistry major for three years, and I thought I'd be going to medical school. Like Rachel, I was very quiet, and I read a lot. One night some friends were going to a standup comedy place and I went with them. Then I started doing standup myself. I hated to perform, but I met a lot of people through it. "I opened for Jerry Seinfeld, Roseanne Barr, and others which led to me writing for Seinfeld. Now... I am quite introverted and most writing for television is done in a room full of people. I hated it. Then in January of 2015, both my kids went back to college. It was -11°, and I thought to myself, 'You're not going back to TV writing for a few months, why don't you give writing a novel a shot?'" When Karen asked, Goldman said that Raymond Chandler was a big influence on him, especially with characterization and social commentary. Who are Hall's influences? "Raymond Chandler, Stephen King, Judy Blume, and Jackie Collins." Matt admitted that "I didn't start reading mysteries until six or seven years ago. I was a bit of a lit snob, but I love that the mystery carries the plot so that the characters don't have to do it all the time." Rachel said, "I have to be angry or interested in something before I'll start writing. I work full-time. I have a thirteen-year-old daughter who's heavily involved in sports. I have to outline when I write. I'm a control freak, and I need a map!" "Those CSI shows on TV make me angry," Goldman admitted, "getting in the way at crime scenes with their guns! I wanted to write a book in which those people didn't matter. "I get a wisp of an idea, and I start writing. 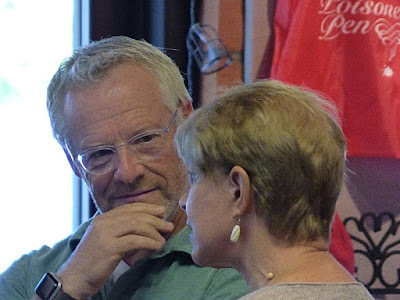 I'm 60,000 words into my third book, and I'm hoping it will work." "I wish more movies and TV showed the Los Angeles that I love. I love writers who have a strong sense of place!" Rachel said. Goldman said, "I think most people want to be brought into a world that's real and fair. I like learning bits and pieces, and I really enjoy writers like Jo Nesbo and Michael Connelly because they know what they're writing about." 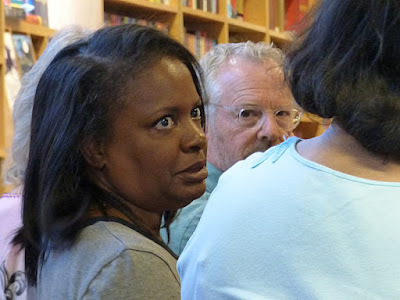 Continuing the talk about the writing process, Hall said, "I like the fact that we can sneak all this educational stuff in because it's fun to read about it." When Karen asked her about BookShots, Rachel said, "I got a call from Patterson's editor asking me if I wanted to do this. At first I said NO! but then I went out to dinner with my husband. We talked it over, and I realized what an incredible experience I'd be missing if I didn't do it." Hall said, "I tried writing in third person, but it's just not my voice. I'm much more comfortable in first person. It just flows. Although if I had to write a book in the third person, I could." "First person just felt natural," Matt added. Hall then told us of a problem she had when writing in first person and that particular character died. She worked through the issue with her editor. When Goldman wrote Gone to Dust, he was already contracted for two more books, so this is the first book in a series. "The second book will be about in June 2018, and the third in June 2019. 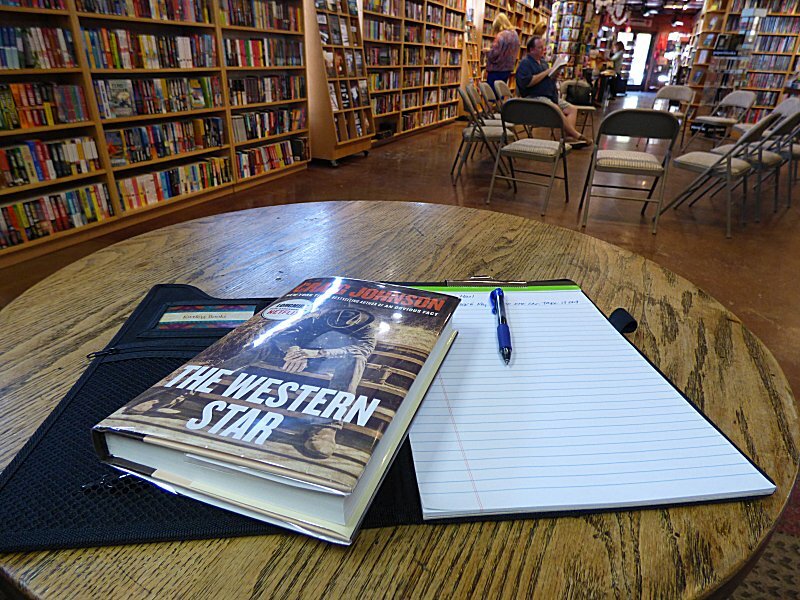 Writing books is so much better than writing for TV! There is a pure voice coming through, and no one else is weighing in on what you're saying." What have they been reading lately? For Rachel, it's Michael Connelly and random non-fiction like Darcy O'Brien's Murder in Little Egypt. For Matt, it's Rex Stout, Hamlet, and Michael Chabon's latest book. When asked about book covers, Hall said, "I have some say on the covers. My husband is an illustrator, and covers are important to me. When my second book came out, the cover looked so much like the cover of the first book that many people didn't buy it-- they thought they already had!" "The cover on Gone to Dust is really cool," Matt said. "It's actually printed on the book itself, and the cover is see-through acetate." Both authors said that they loved working with Tor/Forge Books because they cared about authors, they cared about the writing, and they were very collaborative. It's always nice to hear that writers are happy with their publishers. It has to make writing just that little bit easier. I am so glad that I went to this event. I came away with two new authors whose books I can't wait to read, and that's always a good thing. And just one stray thought before I let you go. 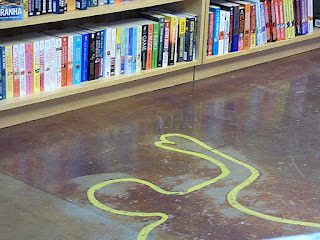 The body outlines on the floor at The Poisoned Pen have always made me smile. Why is it that when I looked at one on that Sunday, it looked as though the "person" died while trying to reach for the books on that bottom shelf? I always love the PP 'author lineups' you share here, Cathy. So glad you had a good time! Wish you could join me! 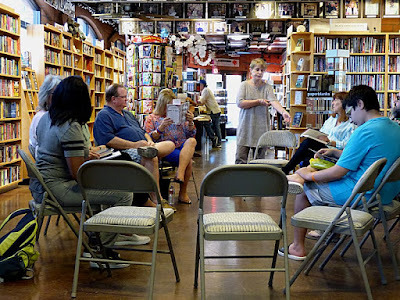 I always enjoy and look forward to reading about the authors' evenings at PP. And I always wish that I was there. But I will do the next best thing and put these writers on my lists. I have a pile of ARCs to read, but I'm really looking forward to reading Rachel Howzell Hall's first Lou Norton book. Yep. And I'll look for a review here. But I am adding her to my list.